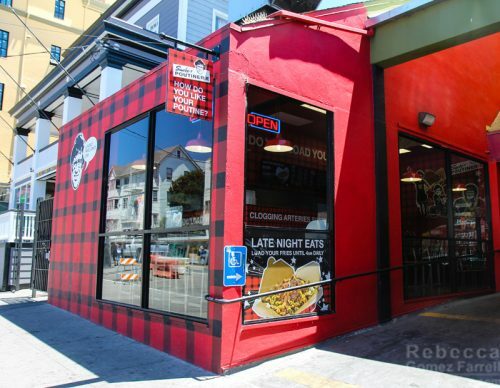 Home / Dining in Berkeley - CA / Find your Mac Daddy at Smoke’s Poutinerie! I recently tried the Mac Daddy at Smoke’s Poutinerie in Berkeley (2518 Durant Ave). Little did I know beforehand that there was such a thing as a poutinerie or that this Canadian chain had an outpost in the Bay Area! As a fan of fries, and a bigger fan of tons of crap thrown on fries, I was not about to decline their invitation to try the Mac Daddy summer special dish. Obligatory disclaimer: That means everything I tried in this review was free. Smoke’s has positioned themselves well, right across the street from UC Berkeley, and they are smart enough to know that hours lasting until 4 AM are a VERY good idea in a college market. I live about two miles away and I, a 36-year-old night owl, am adding them to my mental inventory of late-night eats. You would be surprised at how few there are out here, folks. Shame, shame! At Smoke’s, you order at the counter then grab a seat at the bar running along its window walls. 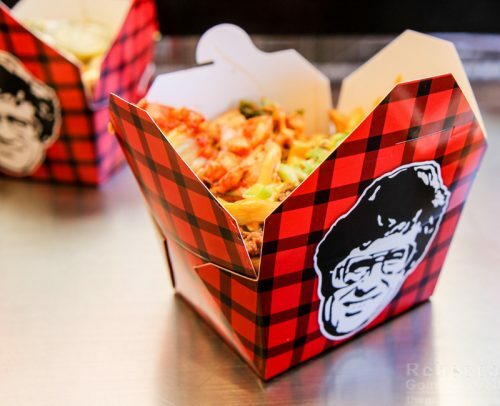 There are A MILLION combinations to choose from (I counted), though you can stick with just fries or the traditional Quebec-style gravy and cheese curds. In some stores, there’s even a poutine with pierogis on top that makes me wonder what I’ve been doing with my life in the face of such genius. Sizes are snack, meal, and WOW, ranging from $3 for a snack-size plain fry to $13 for a WOW-size specialty poutine. Both of our selections were meal-sized specialty poutines ($9), and one of them would have filled up my friend and me, even if we’d been famished. They have HEFT! Side note: Please excuse my shouting in caps. Can you blame me? It’s poutine, the forebear of all cheese fries. BE EXCITED! The 99.3% Original Mac Daddy perfectly captures the Big Mac in poutine form–I’m pretty sure the Big Mac is what that 0.7% unoriginality refers to. If you’ve ever wanted to forgo alternating between fry and burger bite, then this is for you. A sprinkle of sesame seeds on top evokes the sesame bun, and a sharp cheddar cheese sauce, shredded iceberg lettuce, plentiful special sauce, and prime hamburger meat bring in all the essential ingredients to satisfy your Big Mac cravings. It’s the sliced pickles on top that really seal the deal, however. They have just the right amount of tang and flimsiness to conjure the appropriate connections. The special sauce is more mayonnaise than Thousand Island, but that 99.7% original has to be earned somehow. The fries, however, are thicker than Mickey D’s, and dare I say superior? I know you can’t see them beneath all the beauty of Smoke’s globs of stuff, but by keeping their skins on, they are packed with plenty of toasty potato flavor. The tips were still crunchy after being sauced and smushed for fifteen minutes worth of eating. That’s impressive! These are fries I would happily munch plain, but the gods are good and I did not have to. We even got to try a second specialty combination! The Bulgoger is the Berkeley branch’s featured dish. 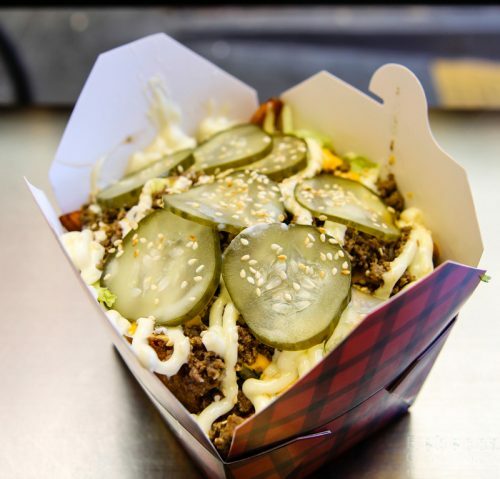 I have dubbed it the ultimate fusion food because it combines the already blessed union of Korean barbecue and Mexican tacos with the Canadian poutine. I’m pretty sure it blasts “It’s a Small World” on a cellular level as soon as you take a bite. Can’t you feel your gut bacteria rejoicing? The diced beef tastes quality and has a slightly sweet marinade. Smoke’s gravy takes center stage, providing richness that overrides the sriracha mayo. The kimchee is less pungent than most, so your less brave friends may be able to handle it. I absolutely loved the grilled scallions in the dish, but I always, always love those. I will likely order the Bulgoger again. 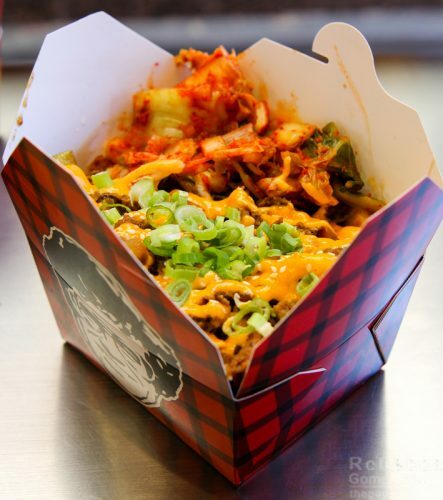 If I can make any suggestions to Smoke’s Poutinerie, it would be a request for more cheese curds and less cheese sauce. The gravy and/or other condiments already provide plenty of moisture, and cheese curds are such an iconic poutine accoutrement that they should be front and center rather than hard to pick out of the pile. That reminds me of my second suggestion! Real forks, or at least thicker plastic ones, would be much better for literally picking things out of that pile. The fries stand up well to the pressure placed upon them, but getting down to them can be a challenge! The Mac Daddy is only available until August 7, so go now if you want to get your fast food burger fix in fry form! Luckily, the Bulgoger’s available in Berkeley anytime. Thanks for having me out, Smoke’s Poutinerie! You’re on my late-night radar permanently now. 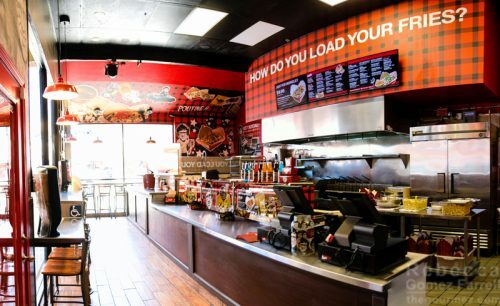 4 thoughts on : Find your Mac Daddy at Smoke’s Poutinerie! Smoke’s does the traditional style as well, and I did quite like the gravy, though I’m not as sure about the curds – didn’t get enough of them on these deluxe version! this is nov, are they still open? Looks like it from what I can see! Feel free to check for yourself by clicking their website above to get a phone #.